Hit up Google’s Chromebook site and you can now choose from a trio of Wi-Fi models, one of which is currently available with a 3G option. Prices widely range from a low of $199 up to $549 for the devices due to different hardware configurations, specifications and battery capacity. Yet all of these run the same Chrome OS: The Chrome browser on top of a Linux build without the ability to install anything beyond web browser extensions. I’ve been using all three base models for some time now. I spent $449 for the Samsung Series 5 550 model in June and it has become my primary computing device for work purposes. Last month, Google introduced an updated Samsung model, simply called Chromebook, that is lighter, thinner and cheaper at $249. The device runs on Samsung’s latest chip for smartphones and tablets. 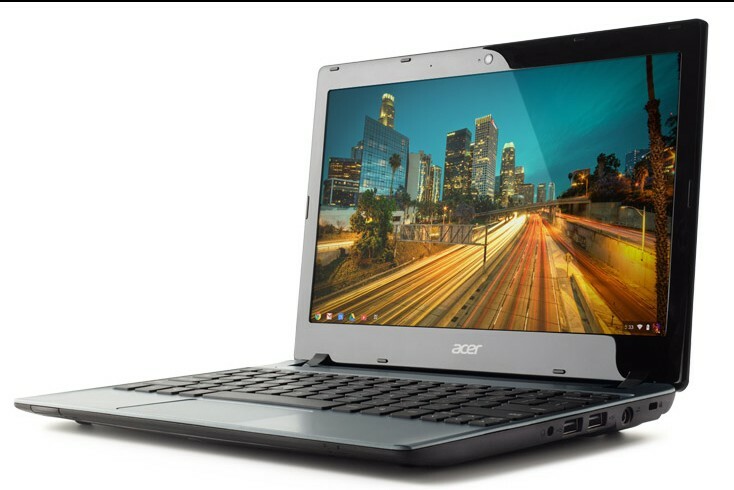 And earlier this month, Acer introduced the $199 C7 Chromebook; a repurposed Windows(s msft) laptop offers less battery life than the other two Chromebook choices. After the latest software update, the C7 is rated for 4 hours of run-time, while I routinely see between 6 and 7 hours on the Samsung models. But how does it perform? At this point, I plan to stick with my $449 purchase because it offers the best performance and can still run as long on a single charge as the $249 version. If I hadn’t already invested the money, I’d likely consider the lower priced Samsung model over the even less expensive Acer C7, mainly because of the 50 percent boost in battery life. Even with some minor compatibility issues that are the process of being addressed, for me, battery life trumps many features in a mobile device. I’m also finding that Acer’s use of a hard drive instead of flash memory brings some unwanted noise to the experience and even some web page stutters after opening multiple tabs. Previously opened web pages appear blank every once in while, for example, and I’ve heard some streaming music pauses as the device loads additional web pages. For basic use, the Acer, or even the $249 Samsung model, will surely work fine, but for Chrome OS “power users” — if there is such a thing — paying a premium for the $449 model is money well spent. If have the Samsung Chromebook 550, but I am thinking about the latest Chromebook of Samsung. What do you think? Do I improve me concerning the hardware? which of the third gen models plays/runs 1080p better/smoothly in your opinion? The Acer with the hard drive seems like a good situation for someone like myself who might be working off line when writing. I like the idea of having access to files even when connectivity in Vermont gets iffy. The hard drive and the hard wire internet connection, as opposed to “only” wireless or a monthly plan are calling to me. What am I over looking? I do like the sleek look and feel and samsung brand name, but neither the hard drive or hard line internet connection. Also, any chance that the price drops as the end of the year gets closer? The AcerC7’s 320GB HDD ia also half the speed of the Samsung’s SSD as the doubling of boot time will attest to. It will also slow down other operations like paging RAM when running multi-tasking apps, or switching tabs, spooling media to disk, so isn’t a feature, it is a cost cutting exercise. I see the Acer C7’s clear advantage over the Samsung as the 320GB HDDs hard drive’s ability to allow installing Windows or Linux on the device to dual boot with ChromeOS for those who want to tinker with it. can you use them for word processing / spreadsheets etc applications? I have the acer and I love it. The hard drive noise is hardly noise compared to other laptops. As a matter of fact only two faults I can find so far. Crappy camera support…I mean really minimal and the track-pad isn’t the greatest. I give Google, Samsung and Acer a lot of credit for not giving up on the Chromebook, despite a rough start. It’s not always easy to introduce a new concept in IT. The Chromebook is not for everyone, and that’s OK. There are plenty of people that would be happy with a low-cost, easy to use, fast-starting device. Most of us spend our time on the internet anyway. As Chromebooks become more popular, more people will want to use them for work, even if it’s only to do some occasional work from home. The issue then becomes finding ways to access Windows applications remotely. One solution is Ericom AccessNow, and HTML5 RDP client that enables Chromebook users to access Windows applications and Windows virtual desktops from within the browser. AccessNow is as easy to use as the Chromebook itself. There’s nothing to install on the Chromebook. You simply click on a URL in the Chrome browser, and launch your Windows applications or virtual desktops inside the browser tab. Have you done a real world battery life test with the Acer yet? Yup, and I’m getting close to (but not quite) 4 hours of run time during my typical work flow of reading/writing blog posts, editing pics for them and streaming music on Amazon’s Cloud Player. 3:30 to 3:45 of run time is what I’m now averaging. Don’t you think that these are the sort of devices that Microsoft should have made, or at least made the OS for? Here we have Google introduce an entirely new device category. It is an immediate sales success, despite Google botching the launch by not having enough units available. At least until the Samsung ARM-based Chromebook sold out, it was the hottest selling laptop in the United States. But yet again, Microsoft is nowhere to be seen as a new category of computer devices arrives. What’s Microsoft going to do now that the best-selling laptop doesn’t run its OS? Is Microsoft going to take another 4 years to come up with an answer (like it did with finger-touch-interface phones and tablets?) Then in 4 years, Microsoft will come out with the IE OS, with a nice interface, but 4 years late, and will wonder why it didn’t sell. Hey Kevin, I’ve been thinking about buying a chromebook but still have some questions about the OS. It would be nice if you made a follow up video detailing how it has fared after a year of use. When you say your chromebook is your primary pc does this mean you use it to write articles for your website and edit videos? I purchased the new Samsung Chromebook and liked it alot. However, after about a week, I sold it and purchased a used 550 from Amazon Warehouse Deals. It cost $80 more (though I made some of that back from the profit I made on the $249 Chromebook), but the faster processor, better build quality (I like the larger trackpad and metal wrist rest), and brighter screen made it worth it for me. I’m Interested in checking out a Chromebook for a secondary computer for our household. I’m definitely thinking of the $249 Samsung. Battery life is important in any mobile devices and $249 is a heck of a deal for what you’re getting.